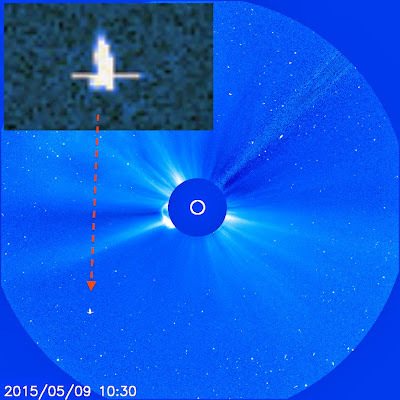 Not one, not two, but three UFO “ships” — and not just regular UFO ships but “massive” UFO ships — were captured in NASA images from the Solar and Heliospheric Observatory this week, at least according to sharp-eyed researchers who spend large amounts of time searching for anomalies in NASA photos and other sources of celestial imagery. The UFO ships, according to the researchers, were spotted as they entered orbit around the sun — the sun seeming to be a popular destination for alien visitors over the past several months. In March, the same highly active researchers found what they said was a huge object traveling an incredible speed around the sun. Read the Inquisitr account of that sighting at this link. 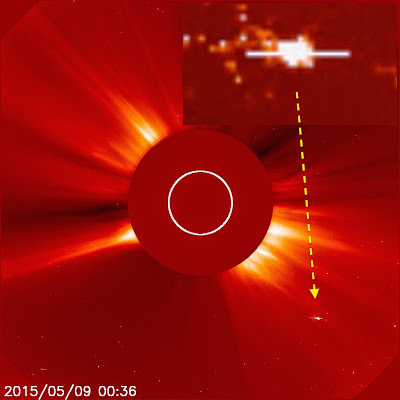 In April, another seemingly huge object was also spotted plunging toward the sun. This time, the shape of the object bore a strange resemblance to an ancient Egyptian hieroglyph, perhaps providing evidence of ancient UFO visitors, according to the UFO researchers. The Inquisitr account of that sighting is available at this link. The latest triple sighting was uncovered by prolific YouTube UFO researcher Streetcap1, who posted the above video, taken from the NASA SOHO site, which allows users to create videos of any solar image in the vast archive. If you somehow miss the UFO sightings in the video, here is one image, as isolated by Scott C. Waring of the prominent UFO Sightings Daily blog. And here is a second object. Note the zoomed-in look at the UFO in the upper right corner of each image. So why are the UFOs converging on Earth’s sun all within days of each other? Waring offers his theories. The latter possibility is alarming, at least if we’re planning on being around 5 billion years from now. But if the UFO researchers are to be believed, NASA may want to keep a closer eye on whatever’s going on around the sun these days.